The magnificent Arun River that springs out from the famous Mt. Makalu, which is 8463 meters above sea level, is one of the tributaries of the Saptakoshi (union of seven rivers). And along the river path lie some spectacular view of Mt. Kanchenjunga, Makalu and Everest, remote villages and valleys and cozy beaches. The put in point of the 70 kilometers long river is Katikeghat and the take out point is Chatara. This river rages with some class 3 and class 4 rapids making it a thrilling rafting experience. Camping at sedate beaches along the river give you plenty of time to relax and get to know your fellow rafters. The best seasons to choose this rafting journey are from October to December and March to May. Rafting at Arun River, is an ideal option for someone who is more into thrill and is looking for a wilderness experience. Today we’ll drive to Dharan from Kathmandu, which takes around 14 hours. And from Dharan we’ll drive to Tumlingtar, which will take another 10 hours. We will drive to Katikeghat from Tumlingtar and set up a camp by a river bank. Our rafting journey begins with safety and paddling instructions from the professional guides. We will raft down to Tumlingtar and enjoy a peaceful and serene view. From Tumlingtar we continue our expedition to Kewa Khola, the camp site for the day. On the 4th day, we paddle to Sabha Khola. We will hit three rapids of class 3 and class 4 just before reaching the suspension bridge of Raighat. The camp site for the day will be Raighat, where you can spend a cozy night at the beach. The 5th is also known as the “Green Day” as we will be rafting among the greener side of Nepal. 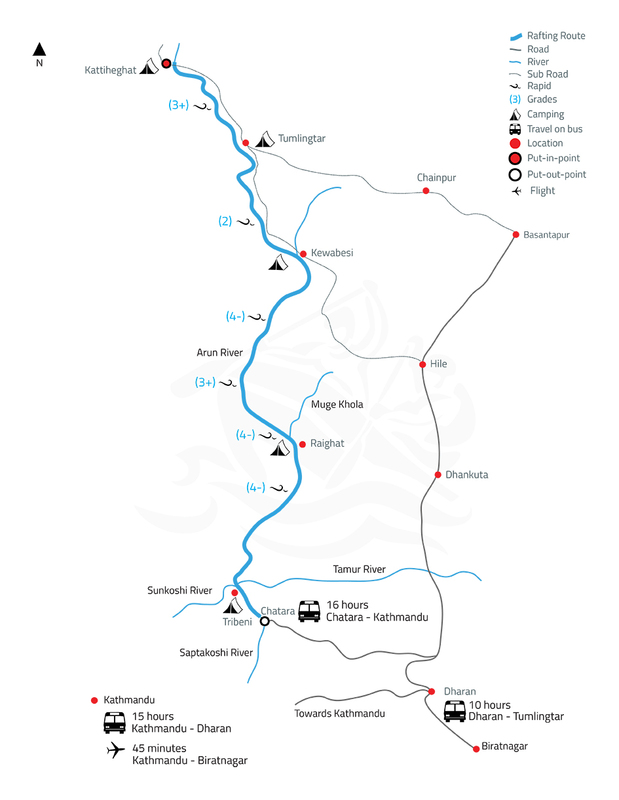 We will raft to Tribeni (union of three rivers) from Raighat and hit continuous rapids throughout the journey. After rafting for around an hour and half, we will reach our take out point, i.e. Chatara, from Tribeni and the 6 days of awesome expedition comes to an end. You can either drive back to Kathmandu from Chatara or fly back to Kathmandu from Biratnagar, which is an hour and a half drive from Chatara.